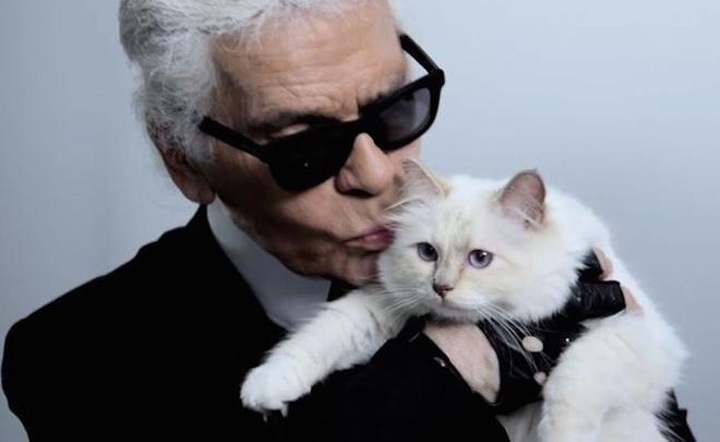 Karl Lagerfeld’s famously adorable white kitten, Choupette, probably makes more than you. In fact, with an annual income of 4 million dollars, the bourgeoisie kitten is in the 1% bracket and she has a burgeoning fashion career to match. Lagerfeld recently revealed to The Cut that Chopette had raked in 4 million USD in the last year alone for appearances, like modeling for a Shu Uemura campaign. The spoiled kitten also boasts not one, but two maids that cater to her every need and she’s racked up more first class air mileage than you could count. Choupette also has a large and dedicated fan base with approximately 60,000 followers on her Instagram account. And that’s not all, she’s a cover girl too. Choupette was picked to cover Lucky magazine’s 100+ Stylish Animals issue, which will hit newsstands on April 8. Cat's out of the bag: Revealing my cover for @luckymagazine's special edition issue on newsstands 4/8! Merci to @evachen212 and the #LuckyMagazine team for all your hard work. Lagerfeld gushed about Choupette saying, “She is the center of the world. If you saw her, you would understand. She is kind of Greta Garbo. There is something unforgettable about her, the way she moves, the way she plays. She's an inspiration for elegance. For attitude." As the official cat of Chanel and muse to Karl Lagerfeld, we can’t help but admit that her glamor is well deserved––even if we are jealous.